January 21, 2011 By This post may contain affiliate links. A normal weeknight meal is usually prepared in a hurry and Valentine’s Day falls on a Monday this year. So, I wanted to devise a pretty simple, yet very fun main course for this special Valentine’s Day dinner. I was cooking chicken the other night and noticed that each breast with it’s rounded top and pointed end, looked a bit like a heart, so I grabbed a large heart shaped cookie cutter and created a perfect heart shaped chicken breast. Cookie cutters can be used to create so many fun themed meals. They are simple to use, cheap to buy, and easy to find. Heart shaped cookie cutters are sold in the grocery stores these days, so you don’t even have to make a trip to a specialty store to find them. So now all I needed to decide was how to prepare my chicken. We love Italian food, so I decided to make Chicken Parmesan. It was one of the first things that I learned to cook, and it is still one of my favorite meals. The crunchy Parmesan coating on a moist tender chicken breast smothered in melted mozzarella cheese and marinara sauce is perfection on a plate, to me. Of course it isn’t the most heart healthy meal when the chicken is pan fried, so I have found a way to create a crispy coating and moist juicy chicken without frying. I use a small amount of olive oil to crisp up Panko breadcrumbs (Japanese style crispy breadcrumbs) before adding them to freshly grated Parmigiana-Reggiano cheese (the very best Parmesan cheese). To keep the chicken moist and tender, I use a trick that is oftentimes used when frying chicken. I allow the chicken breasts to soak in buttermilk for a while and I am sure that even if the chicken is cooked a bit too long, it will remain moist. I also don’t need to coat the chicken in flour and egg, because the breading adheres to the buttermilk soaked chicken easily. Fewer steps on a busy night, makes me happy. To top the chicken, you can use sliced mozzarella from the deli or slice your own fresh mozzarella. Use your favorite marinara (spaghetti) sauce or make your favorite recipe. For a simple weeknight recipe, I will opt for using my favorite jar of Prego Traditional Italian Sauce. I used chicken breasts that were about 6 ounces and were a nice even thickness. If your chicken is very thick on one end, you may want to pound it to a more even thickness, so the chicken cooks more evenly. Lay chicken breast on a cutting board. Press a large heart shaped cookie cutter into the breast. 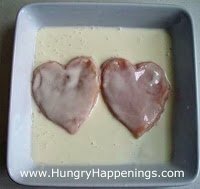 Use kitchen shears or a knife cut though the chicken breast, cutting around the heart shape. Reserve excess chicken. Season chicken breasts with salt and pepper and set in a shallow dish. Pour buttermilk over chicken. You can press together your chicken scraps into a flat oval and soak them in the buttermilk as well (then proceed with the recipe using the scraps.) Cover the dish in plastic wrap and refrigerate for 30-45 minutes. Remove and flip chicken breasts over. Return to refrigerator for 30 more minutes. The buttermilk will work to denature the proteins in the chicken which will make it more tender. You can leave the chicken soaking in the buttermilk for up to 3 hours, but be aware that if it is in the buttermilk for too long, the chicken will become mushy. While chicken is marinating, prepare the crunchy Parmesan coating. Pour panko bread crumbs into a cold skillet. Add olive oil and toss to coat. Place over medium low heat. Stir often until the bread crumbs become golden brown. Do not leave the crumbs unattended. They will burn easily, if not stirred often. Remove toasted crumbs from the heat and pour into a shallow bowl. Allow to cool. Stir in grated Parmesan cheese. Set aside. Pre-heat your oven to 475 degrees. Line a baking sheet with aluminum foil. Lay a metal cooling rack over pan and spray with olive oil cooking spray. Remove chicken breast hearts from refrigerator. Pick up a chicken breast and allow the excess buttermilk to drip off. Lay chicken in the crunchy Parmesan coating. Press the coating onto the chicken. Pick up the chicken and allow excess coating to fall off before setting it on the prepared baking sheet. Spray chicken breasts with olive oil cooking spray. Note: Using a cooling rack will allow for a nice crispy crust. If you bake it directly on a baking sheet, flip the chicken midway through cooking. Meanwhile, prepare your cheese shaped hearts. I used thick slices of fresh mozzarella and thought it tasted great, but deli sliced mozzarella will work well also. 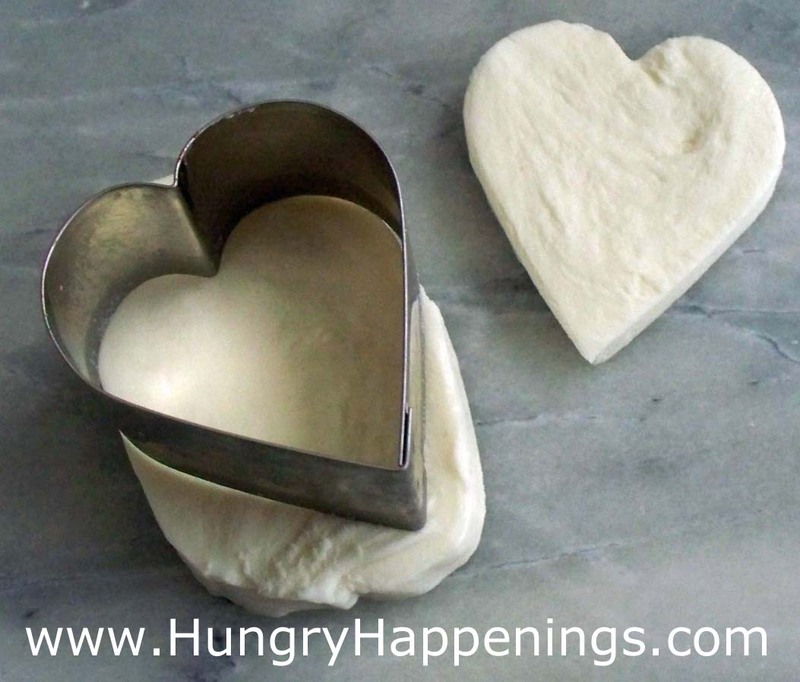 Cut cheese using a heart shaped cookie cutter that is smaller than the cutter used for the chicken. You can also just sprinkle on shredded cheese, if you prefer. Once the chicken has baked for 20 minutes, remove it from the oven and place a slice of cheese on top of each chicken breast. Return to oven and heat for about 5 minutes until the cheese is melted, and the chicken registers 165 degrees on an instant read thermometer. Heat your marinara sauce on the stove or in the microwave until it reaches the desired temperature for serving. 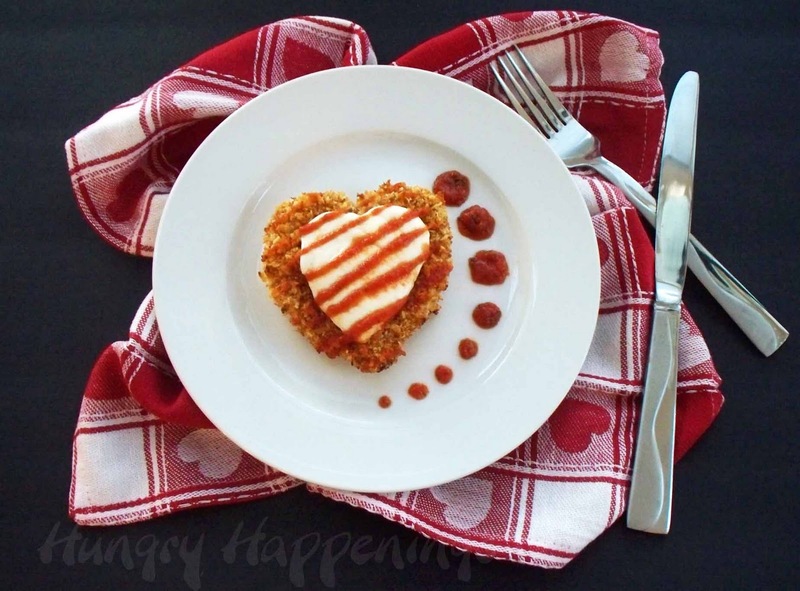 Pour some hot marinara sauce on a dinner plate and top with the heart shaped chicken Parmesan. If you want, you may drizzle some sauce over the chicken breast and add some decorative drops of sauce. I poured some sauce into a squeeze bottle, and piped it out onto the plate. Serve hot. 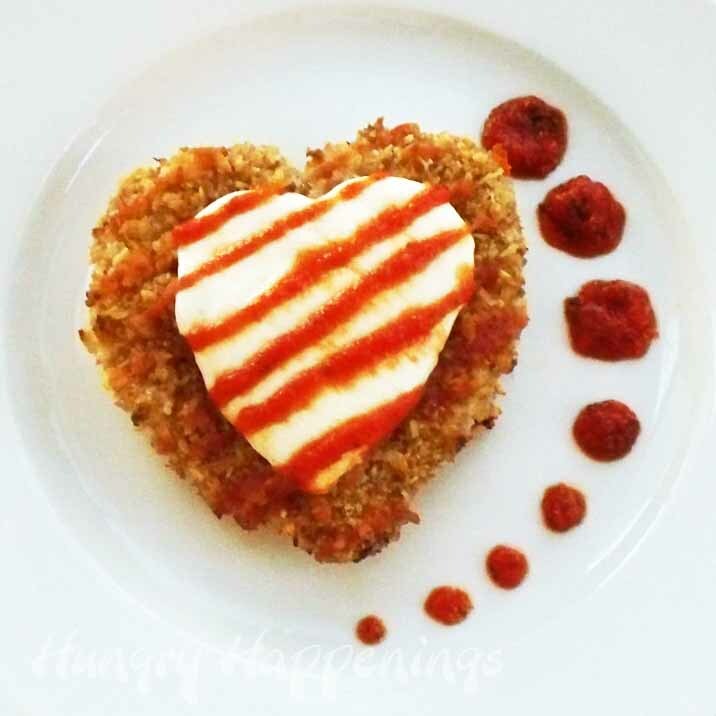 Serve these fesitve Chicken Parmesan Hearts with Salads Topped with Tomato Hearts for a wonderful healthy dinner. If you feel you need a more substantial meal, boil some pasta, top it with spaghetti sauce and serve alongside your chicken. Just make sure you leave room for dessert. Oh my stars these look to beautiful to eat! Who ever would have thought of cutting the raw chicken into a shape- too dern cute! 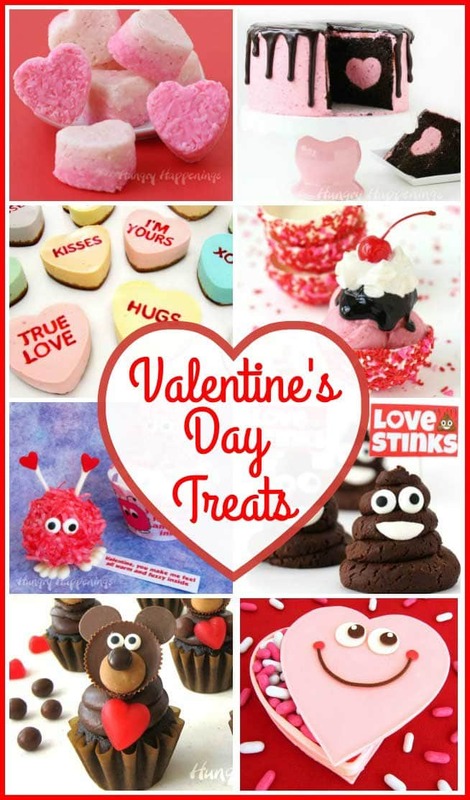 Just came across your blog from a picture of your super cute Nutter Butter Puppies (Googling for a Peanut Dog) After spending a while looking at your amazing and cute foods I loved finding your Valentines Ideas. This year we'll have a new family addition (Gosh I hope she wouldn't be 3 weeks late!) So finding good recipes that are simple and tasty while being adorable is exactly what I needed. Thank you so much for this year's Valentine's dinner idea! Hi Sharon, I'm so glad you found Hungry Happenings and like my recipes and edible craft projects. I'm always here to help if you have any questions or problems while working on one of my projects, so don't hesitate to ask. Also congrats on your new family member. What an exciting time for you! Have a wonderful Valentine's Day. Very good idea and so pretty. I’ll be preparing this meal on this weekend with my children as well as for our Valentine’s Day meal. Have anyone tried this dish with shrimp? I have never tired shrimp parmesan but I bet it would be good if you use fried shrimp. You could set two large shrimp together to form a heart. Have fun!